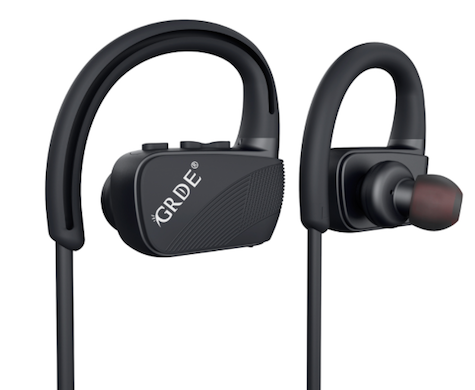 Price: $32 to 36 U. S.
The GRDE Wireless Sports Earphones have large hooks that wrap around the ears to provide a more secure fit for running and other athletic activities. The ear speakers are large and audio is decent, but for $36 they are not my first choice because I found them to be too big, somewhat clunky, and only slightly comfortable if you’re doing more than walking around the house or sitting at your desk. I used these Bluetooth in-ear headphones on a 90-minute bike ride and the experience was less than satisfying. If you wear glasses and a helmet, the hooks are obnoxious. They’re heavy duty and really will stay in place, but it took too much trouble to get them to a comfortable position alongside my glasses. After an hour I wanted to stop and get them off my ears. This headset is also supposed to be passive noise cancelling, and they work well if you’re doing ordinary chores around your yard or apartment, but they can’t compete with road traffic or wind. When you’re exercising outdoors, it’s best for safety’s sake to be able to hear some of the sounds around you. The key is to find the right balance. Sound separation is fine and while bass is a bit thin, the overall audio experience is suitable for anybody who isn’t an audiophile. Voice communication is clear, and inline controls enable you to answer calls on your iPhone or other Bluetooth phone by pressing the Multi-Function Button (MFB) once to interrupt music. Unfortunately, because of the location of the MFB, I found myself pressing it and interrupting my music every time I reached behind my right ear to adjust the ear hooks.